Ferrari Red Technics turntable goes on sale for £32,000 | What Hi-Fi? The Technics SP10 MK3 NGS is hand-built and finished in Ferrari Corsica Red Micro Suede. Don't let anyone spill their drink on it. Feel like blowing your life's savings? 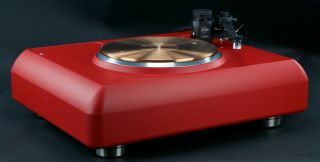 How about buying this Technics turntable, which comes finished in Ferrari Corsica Red Micro Suede? It's a steal at just $38,895 (£32,000). Oh, and shipping will set you back another $695 (£572). The deck has appeared on high-end audio marketplace Audiogon (via The Vinyl Factory). It's the Technics SP10 MK3 NGS, which was originally conceived back in the early 1980s. This one, however, has been hand-built and finished by Artisan Fidelity, which specialises in this kind of thing. Why the high price? you might ask. Well, it's got the word Ferrari in it. Isn't that enough? Also, there's the exacting level of craftsmanship that's gone into creating such an object. As the listing puts it: "The daunting task required for a company to develop, test and produce a direct-drive turntable possessing a similar level of comprehensive engineering in today's marketplace would be, in a word, cost-prohibitive." It describes the turntable as "in essence, the company's crown jewel professional studio direct-drive model." So what are you waiting for? Well come on, what else are you going to spend all that hard-earned cash on? The deposit on a house?